Here in this part of north Texas we have a soil type that is referred to as the "blackland prairie" for obvious reasons. Years ago in Greenville, which is about 100 miles to the east, there was a sign at the city limits that welcomed visitors to "the blackest land, the whitest people." Political correctness has since done away with the sign and slogan since the "whitest people" part might not be taken in the way it was originally intended which, in Webster's definition, meant: of good character marked by upright fairness. Understandable that it no longer exists, no doubt... I get that. But I'm pretty sure that the racial overtones weren't intended back in the day. The interesting thing about our soil, and the reason for the title of this piece, is that it sits on a bed of white limestone just a few feet down which makes for intense contrasts where exposed. Like an Oreo cookie. 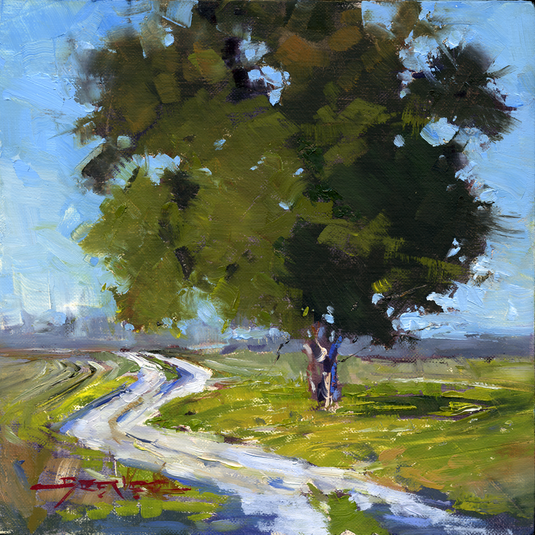 I tried to represent this union of opposites in this painting, with the plowed fields next to the limestone dirt road winding around the tree. This is a smaller version of the same scene which I painted a few years ago. © 1989-2018 Kent Brewer. All rights reserved.